Not for the first time RHI is dominating Northern Ireland's daily newspapers. "RHI inquiry told of DUP bust-ups... and minister's punch up" declares the Irish News' front page. "Bell taped top civil servant over RHI, probe told" is the headline on the front of the Belfast Telegraph. 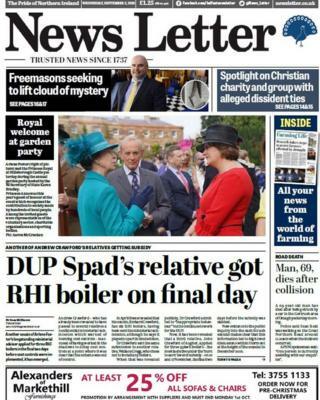 "DUP Spad's relative got RHI boiler on final day" is the News Letter's choice, as the newspapers reflect on an explosive day of testimony at the public inquiry into the energy scheme. While each paper takes a slightly different tack on their lead stories, each dedicates several pages of coverage to unpicking the evidence with plenty of focus on the goings on inside the DUP during the developing RHI crisis. "Rampant jealousies and jockeying at the top of the DUP is laid bare for all to see" is the view of the Belfast Telegraph's political editor Suzanne Breen. She writes that the "disclosure of open warfare within the upper echelons of the party at Stormont is far more embarrassing for the Duppers than any row with republicans". It's a similar theme in the Irish News, where political correspondent John Manley writes that the recent RHI evidence shows the DUP to be "much less sure-footed and undivided than it appeared on the surface". Away from RHI, a series of tragic road deaths has led to calls for the main A5 Ballygawley to Londonderry road to be upgraded. "Town's agony as four killed in car crashes" is the headline in the Daily Mirror, as it reports on the "acute grief" being felt in Omagh, County Tyrone. Three of the deaths came on the same stretch of road - the A5 - leading to calls to finish long-planned upgrade work. "The road needs to be upgraded as soon as possible," says Sinn Féin councillor Marty McColgan. "There have been a number of accidents in recent years and now, after this tragic accident, is the time for work to be completed." Back in the Daily Mirror, it reports that a Belfast man has received emergency surgery on a broken back after staging an impromptu hospital sit-in. Ray Norrie was injured at the start of July but said surgery was continually delayed, putting his leg at risk due to nerve damage. "At the beginning of July, they said this needs to be done really soon. It was listed as an emergency. They would say 'leave it a week' and we'd come back." On Tuesday, Mr Norrie went to the Royal Victoria Hospital and refused to leave until he received the surgery. He's now recovering following a four-hour operation. Another medical emergency makes the headlines in the Belfast Telegraph, after two Northern Ireland newlyweds in Portugal missed their own reception in Portugal after suffering heatstroke. The dream wedding of Claire and Christopher McCann turned to disaster when temperatures soared to 40C at their Algarve venue. The two managed to make it to their first dance, but had to go to bed immediately afterwards. However, they were thrilled that guests stayed and enjoyed the festivities until 02:00 BST. "We made everyone promise to stay and enjoy the party and that made it easier, knowing that we hadn't ruined it for everyone," said Claire. "I would have been so disappointed if people had left because we had to." The pair took a few days to recover but did mange to enjoy a second wedding party in Belfast. And finally - what do you think of when you think about the freemasons? Mysterious, behind-closed-doors rituals? Odd superstitions? Wizardry? Well the News Letter reports that if you want wizardry, you're better sticking to Harry Potter. The paper received a sneak peak at the once secret headquarters of Belfast's freemasons before it opens to the public this weekend as part of the European Heritage Open Day. "We're not a secret society, we're a society with secrets" says Jonny Gray, who will be leading the public tours. "Everybody thinks there's a whole mystery about the freemasons, but there's not. We're predominantly a charitable organisation." But, fear not, some of freemasonry quirks will be on show and explained during the tours, said Mr Gray, along with a living slice of Belfast history.